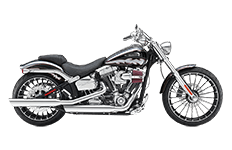 Built for both speed and comfort, Harley Davidson's Softail Breakout is a road warrior in the truest sense of the terminology. When the time comes to accessorize and customize, there's only one name you can trust: Viking Bags. Since their inception, Viking has become an industry leader in saddlebag manufacturing, and the Softail Breakout saddlebag collection is no different. Comprised of models from studded and plain, small and large, riders can find exactly what they need in our online store.